Harrison County Area Technology Center was one of 18 schools from across northern Kentucky that participated in the Gateway Community and Technical College podcast and video competition. Shannan Lee Ammerman graduated from Morehead State University with an Associate of Applied Science in Nursing degree on May 9. She is the daughter of Gary Lee Ammerman of Paris and the late Karen Ammerman, and the granddaughter of Mattie Ammerman of Paris and the late Givens Ammerman, and the late Mr. and Mrs. William Paige of Frankfort. Will Cummins has been accepted and received a scholarship to attend Nashville Auto Diesel College in Nashville, Tenn.
•Sara Owen and Elia Pecorari, will wed in Lucca, Italy this summer. •Julie Hall Wiley and Justin Adam Rayborn will marry at Cynthiana Christian Church on July 25. 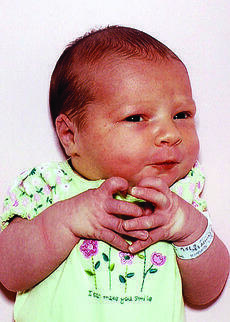 Sutton Ann Koch was born to Charles and Katie Koch on April 27, 2009 at St. Joseph East Hospital in Lexington, Ky.
She weighed 8 lbs. 12 oz. Maternal grandparents are Stephen and Ann (Gorey) Northam of Jeffersonville, Ind. Paternal grandparents are Gus and Theresa Koch of Paris, Ky.; paternal great-grandmother is Amelia Koch of Cincinnati, Ohio. Everyone is welcome to come and enjoy learning, singing, crafts and recreation at Camp E.D.G.E. at Boyers Chapel Methodist Church. VBS will be held June 10, 17, 24, and July 1 and 8 from 6-8 p.m. All age groups are welcome to attend including adults. There will be a potluck dinner on Sunday, June 7 to kickoff the event. Pastor is Barry Holland.